Armley Mill in Leeds is a paranormal hotspot due to the many ghostly reports from staff and visitors alike at this very scary location. 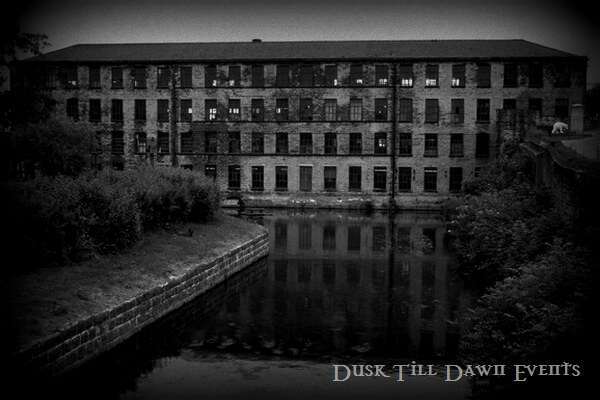 Are you brave enough to join Dusk Till Dawn Events this Halloween as we descend into the darkness of the Mill? This dark, sinister looking building itself actually dates back as far as the Sixteenth Century, but it was not until 1788 that Armley Mills was bought by Colonel Thomas Lloyd who then turned it into the world's largest woollen mill. In 1804 Benjamin Gott agreed to buy Armley Mills from Colonel Lloyd, but sadly in November 1805 the mill was almost entirely destroyed by fire. Benjamin Gott re-built the mill from fireproof materials, using brick and iron wherever possible and it is Gott's mill which survives largely intact to this day. The working conditions in the mill were poor for employees; even children had to work at the Mill, some as young as only Six years old, the Children were particularly vulnerable to exploitation and abuse, having to work very long hours in terrible conditions and consequently as a result many horrific machine accidents occurred here. It was not until 1969 that the mill finally closed as a business due to the increasing use of manmade fibers, in recognition of its historic importance the building was bought by Leeds City Council who re-opened the location in 1982 which is now known as Leeds Industrial Museum. Due to this buildings history we should not really be at all surprised when we hear that Paranormal activity in this location is said to be rife with the many strange, supernatural occurrences such as body shaped shadows caught on camera, machinery starting by its self, extreme temperature changes and strange childlike whispering voices somewhere in the distance, all of which have been reported by daytime staff and visitors of Armley Mill. Dusk Till Dawn Events have this unique building for a Nights Investigation and you have the chance to join in your very own Ghost Hunt at one of the UK'S Most Haunted Locations. You will have full use of Ghost Hunting Equipment and the night will be hosted by experienced hosts. You will take part in various experiments such as Table Tipping and Glass Divination and watch and wait Vigils throughout the Night in the most active parts of the location. This really is Ghost hunting at its best in such a fantastic haunted location it may be cold and very dark so wrap up warm and bring Torches. As this Building may get very cold Dusk Till Dawn Events advise Guests to wear warm clothing. Don’t forget to bring along your Camera’s, Camcorders and any other recording equipment you never know you may catch something on film! We regret this location is not suitable for any one with mobility issues. Parking at event: On Site in Armley Mills Car Park (Sign posted and situated at the end of the road, you will then have a short walk to the Armley Mill main gates from the Car Park). We regret this Location is not suitable for anyone with mobilty issues.